Our buttermilk pancakes are the best available! Simply mix with water and cook on the griddle. Slatter with our world renowned Pure Vermont Maple Syrup and your sure to enjoy! And for an extra bonus, bomb your pancakes with wild blueberries for a magnificent taste experience. Seemed much thinner, ratio 1:1 didn't work well. Easy, quick pancakes for kids & adults. Flavor, easy to use but consistency seems "off" this time. 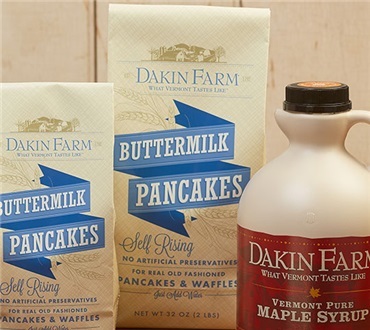 My husband and I love the Dankin Buttermilk Pancake Mix. It is flavorful and makes yummy blueberry buttermilk pancakes. We supply the blueberries. It tends to burn in my waffle iron with adding the oil and egg, so I use it just for pancakes. Yummy! This is the most delicious pancake mix ever! Best pancake/waffle mix I have found. Use it for pancakes and waffles. I could never make good waffles using commercially available pancake/waffle mixes. Two years ago, my nephew sent me a Dakin Farm breakfast gift. I had excellent waffles the first time I tried the mix. This has become a treat for Sunday morning breakfasts ever since.Hint: When making waffles for just one person, the 1/2 egg can be left out. Otherwise follow the recipe.